As president of a B2B marketing agency specializing in lead nurturing, I often advise clients on how to best nurture relationships with prospects and clients. However, the subject of nurturing relationships with vendors rarely comes up. Sure, you might argue that vendors are hired to perform a specific job, and that as long as you compensate them properly, they will provide you with satisfactory products or services. But as Frederick Herzberg demonstrated, incentives are not the same as motivation. According to Herzberg, there are two sets of factors that lead to job satisfaction. On the one hand, hygiene factors, such as employment status, compensation, job security and work conditions, which if not done right, will cause dissatisfaction. And on the other hand, “motivators,” which typically include challenging work, recognition, responsibility and personal growth. These are the factors that will make you love your job. While Herzberg developed his theory to explain what causes job satisfaction or dissatisfaction in the workplace, I find it provides insightful into understanding why vendors love working with some clients and not so much with others. Naturally, bad hygiene factors cause tension. Vendors expect their clients to pay them on time, respect their busy schedule and communicate openly and respectfully. It’s clearly not rocket science. When these factors are met, vendors will usually continue working with you, but they may not LOVE working with you. What could make the difference? Motivators. We often hear that you need to nurture the development of your employees to bring your company to the next level. Could that also apply to vendors? How about you? What is the last thing you’ve done to make your vendors feel special? Share it in the comments section! P.S. 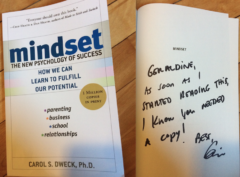 By the way, I highly recommend that you get Dweck’s book. It is very inspirational.